Wondering how to keep track of your period? 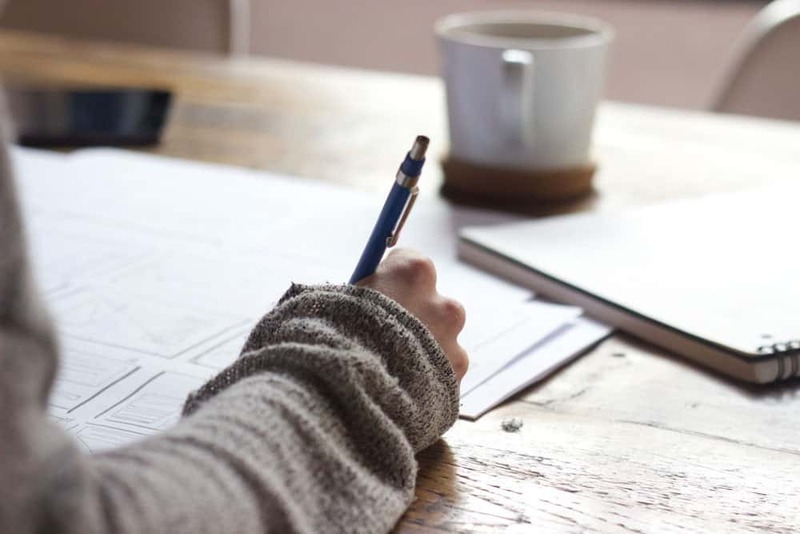 Read this post to learn how to track period cycle calendar in your bujo and the benefits of understanding your cycle. It’s funny that “That Time Of The Month” can make so many of us feel uncomfortable to discuss. 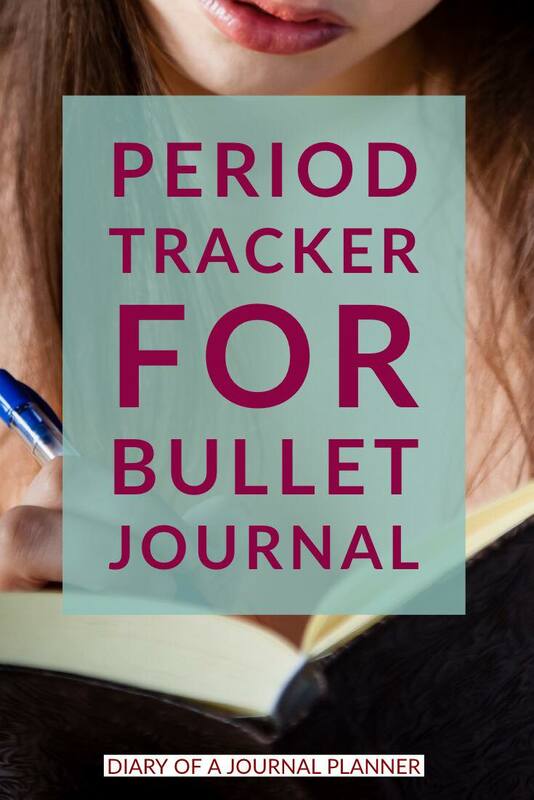 I’m going to forget all the “visit from aunt flow” or “crimson tide” references and tell you why you need a period tracker bullet journal layout! My reason for starting a Bullet Journal was to get organized, be more productive and to learn more about myself. I’m guessing you may have started your Bujo journey for one or all of those reasons too. What does this have to do with periods? Well, keep reading to find out how you too can take advantage of a bullet journal period tracker. 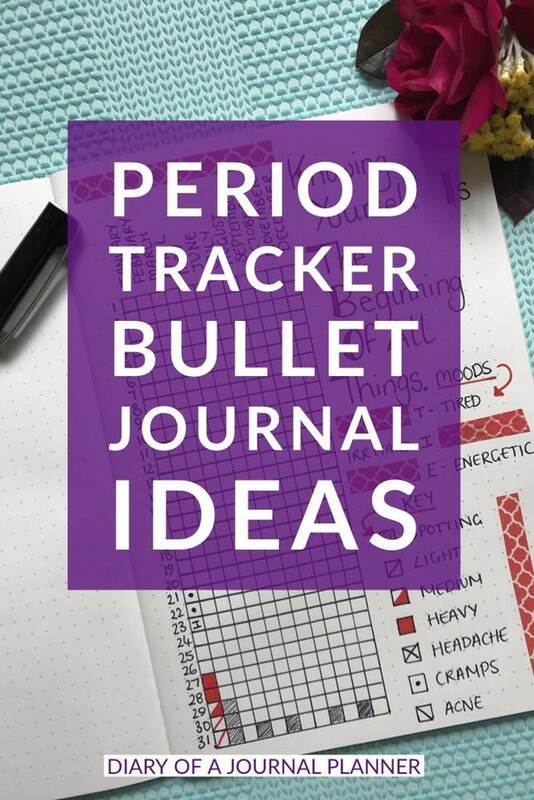 Do I Need A Period Tracker In My Bullet Journal? Until I started keeping a regular track of my monthly period cycle I honestly did not know what my normal cycle was. I also never paid much attention to my moods or how my body was feeling during my cycle. When I started researching into why tracking your period is important I learned that my period doesn’t just affect my life for a few days a month. The hormones during my cycle actually affect everything, all the time! Once I started keeping track with my period calendar, not only did I have a better understanding of myself, my moods and my body but I could prepare for everything and everyday life so much better. Organizing your whole social or work calendar around your cycle is actually really beneficial and means you plan for when you are feeling low or when you know you will have an abundance of energy. For example, most of us tend to feel very tired and low on energy a week before our periods start. Now I know exactly when that will be I make sure I don’t pack my calendar too much and take some extra time for self-care and mindfulness. I was also able to tell my gynecologist dates! Before tracking my periods I was always giving vague answers like “Sometime two Tuesdays ago, I think”. 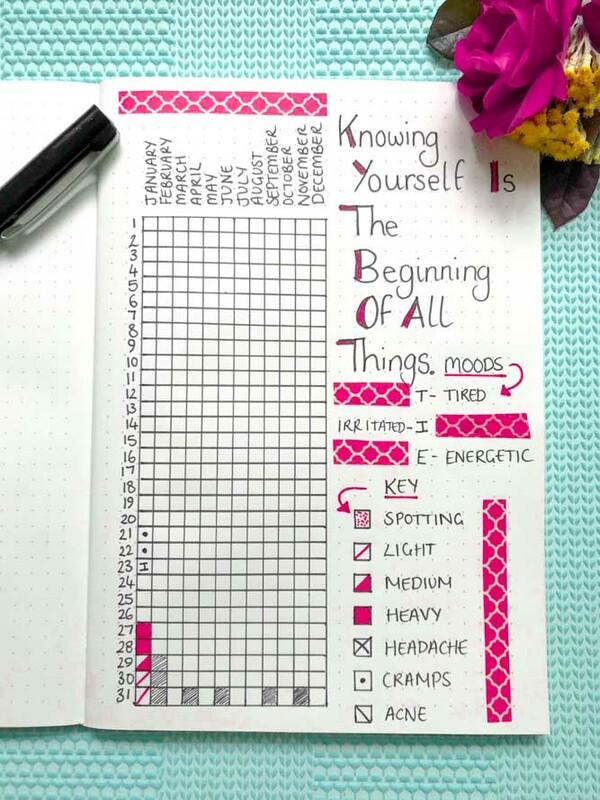 Bullet Journaling is a personal journey but my advice for all women who menstruate would be yes! 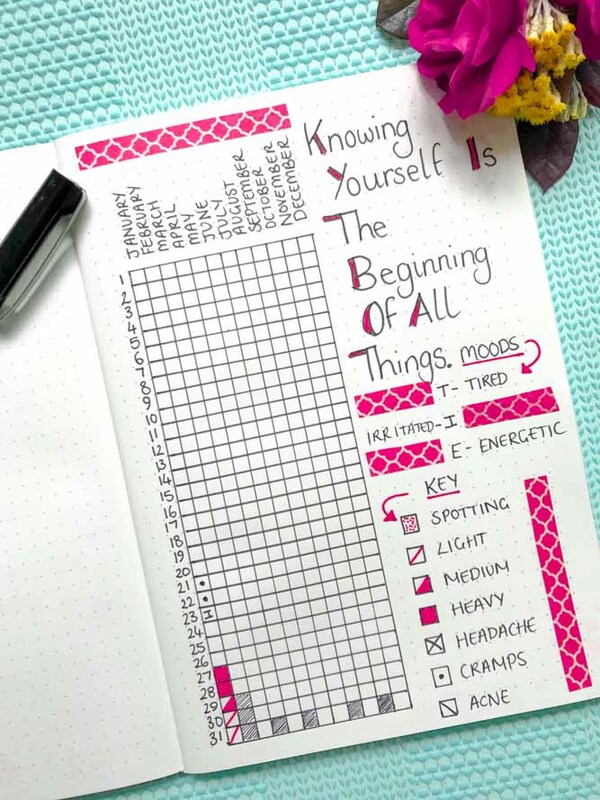 If you really want to have a better understanding of yourself and your body, a period tracker is a great addition to your bujo. It is such a simple way to feel more empowered as a woman. If you are trying to have children then I highly recommend keeping a Period Log to know when you are fertile (this may be handy for if you are trying NOT to have a child too). Just like any bujo tracker, a monthly period tracker has some great benefits. If you track your cycle you can keep an eye out for symptoms like cramping or bloating, you may find that these increase in severity if you have a high salt intake for the month. This means you can take stock of how to reduce symptoms and understand how your body works better. Just by knowing ahead when your period will start, when you may feel tired or off means you can plan ahead and be in control. 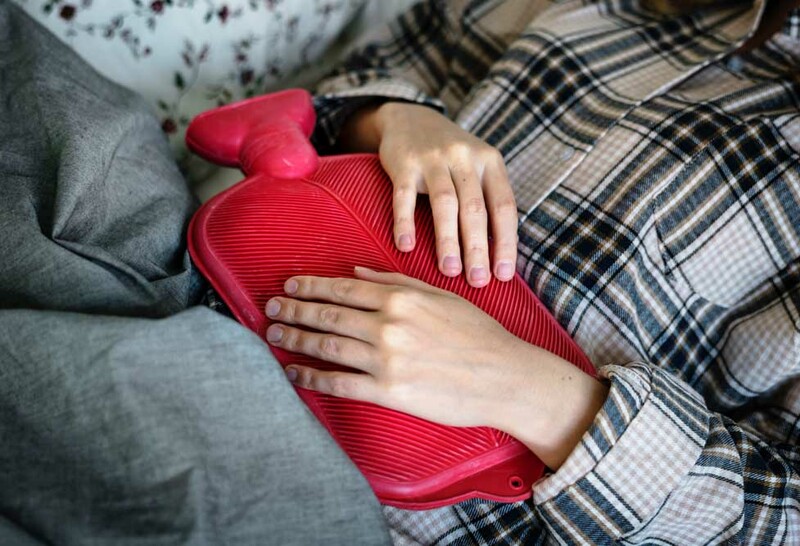 You may be surprised at how much better this makes you feel about your periods. Instead of thinking they ruin events or special occasions, you know they are coming so are well prepared mentally as well as physically. Of course one of the biggest benefits is keeping track of your health. Seeing changes in your cycle is a great way to know what’s happening with your body. If they are small changes you may realize you are super stressed then work on reducing that stress. If they are big irregularities you know that is crucial to go get medical advice. 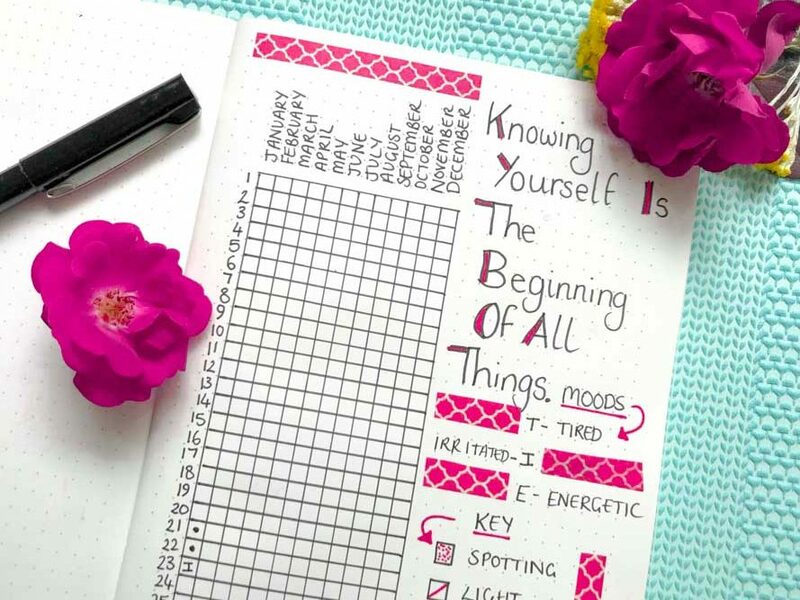 Read on to learn how to track menstrual cycle in your bujo. 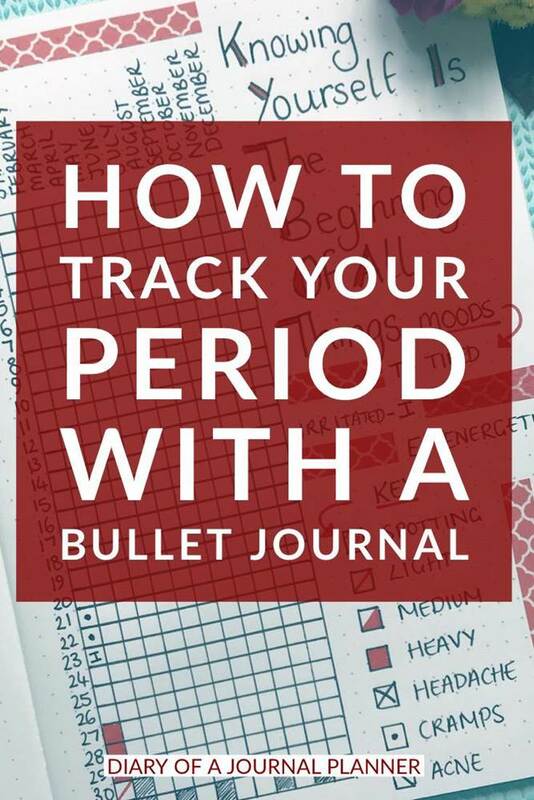 What you decided to track in your bullet journal period cycle tracker t is going to be very personal and depend on the reasons why you are keeping a period tracker. To give you some ideas on what you may want to track, here are some things I have in my personal period calendar tracker log. Menstruating days and the heaviness of flow. This can be a simple light/medium/heavy. Pre menstruation symptoms. Things like acne breakouts, bloating, cravings, and breast sensitivity. Moods. Although you may want to keep a separate mood tracker, like this Year In Pixels. Either way, be sure to keep a check on how your cycle affects your moods. I have done different designs previously but find that this layout is the best period tracker for me. I have found one of the biggest reasons that woman don’t add a Period Tracker to their Bullet Journal is the fear of someone seeing it. If you tend to take your bullet journal with you everywhere you may want to make your period tracker more discrete. Create a dutch door. 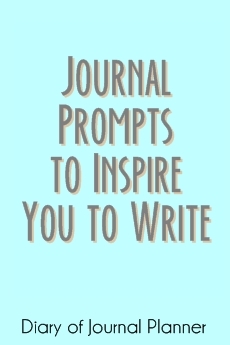 This will hide it from view when you open your journal pages. You can find a video to help you create a dutch door here. Don’t name your tracker/ or give it a name that means something only to you. Such a simple way to stop anyone knowing what your tracker is for. I have seen people call the Shark Week, Strawberry Trackers and so many other creative names. Not using pink/red or any of the traditional period tracker colors. And another supply hack from me, because I love you guys. Ditch the feminine products that create masses amount of landfill each year and invest in a menstrual cup like these. Not only are they much better for the environment but they are healthier for you. I’m not going to lie, they take a little getting used to at first but stick with them and you won’t go back. I find the easiest way to track my cycle is a full year dot period tracker layout with a simple key. This way you have a very quick visual overview of your cycle, symptoms and moods. 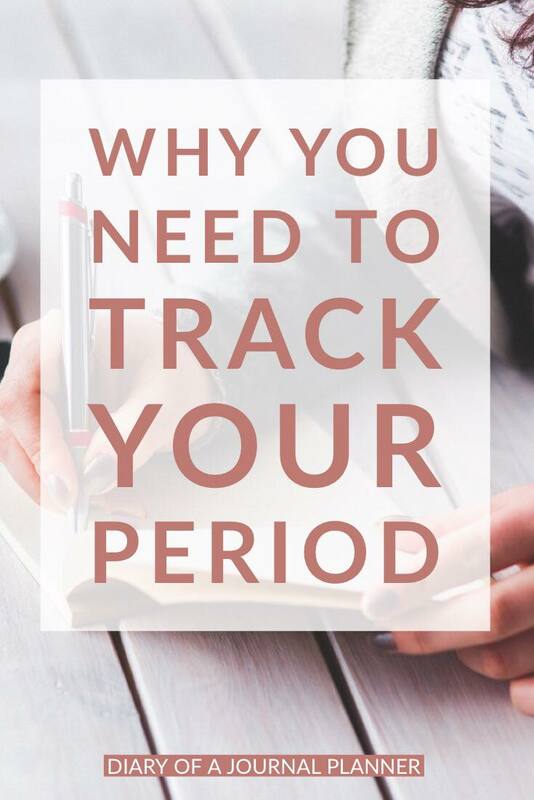 Have you decided to track your periods? What did you learn or think was the greatest benefit of keeping a menstrual cycle tracker? We love hearing about our communities experiences.